Patricia Machas, David Maranha, Andre Maranha /organ), Bernardo Devlin / voice, one track only. 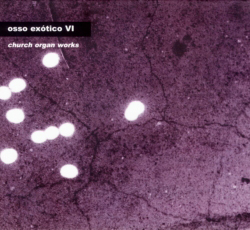 Osso Exocita appear to be a loose affiliation or collective of experimental music-makers, although the David and Andre Maranhas appear on all of their releases to date and Devlin and Machas on most of them. They’ve been recording since 1990, demonstrating at the very least the willingness of their members to play a variety of instruments. Here, they’re let loose on two church organs, and they turn in pleasingly distinctive and interesting performances. The overall feel is fairly minimal, though this is hardly minimalist, and the fact that most of the tracks are refreshingly short-ish gives these improvisations and compositions (the balance is unclear) the quality of little studies, exercises which take small ideas and work them through with care and attention. Sometimes they make much use of repetition — of which David Maraha seems particularly fond — but at others they seem to simply allow the music to drift, in a measured and rather stately way, from one end of the church to the other. Each half of the disc — one from Lisbon, one from Marvila — contains at least one solo by each participant (except Devlin) plus one duet, with the disc climaxing with a six-handed piece which spends nearly quarter of an hour exploring slowly unfolding, often dissonant harmonies. This deliberate slowness is a big part of what this disc seems to be about, and it makes it a nicely ambient disc which, like all the best of that sort, repays closer listening as well.